If you like to live large, then maybe you feel the same way about the size of your mousepad. The Steelpad QcK+ is no wimpy looking mousepad. Get ready to clear off your kitchen table for this one..
Today I’m taking a look at the SteelPad QcK+ Mousepad. Personally I think mousepad is a bit of a misnomer. It would be more accurate to call it a "Mouse Mansion" or "Mouse Subdivision" because, it’s just that big. The QcK+ is a fabric covered mousing surface rather than a hard surface we see in so many enthusiast mousing surfaces these days. It features a thin, soft non-skid backing and it allows the pad to be rolled for storage which, for a pad of this size is a definite plus. In fact the pad comes rolled in a tube in its retail packaging. If you save the package you’ve got a handy travel container for taking the pad to lan parties and the like. The QcK+ measures a staggering 17.7" x 15.7" in size. With mice running at higher and higher resolutions that size is beyond what average users will ever need. The QcK+ is aimed at pro gamers though and many gamers run at lower resolution on their mice to allow for more precision when aiming for that ultimate headshot. It’s also handy for anyone doing graphic design where you don’t want to have your mouse set to ultra twitchy tight settings and instead need to have room for exaggerated hand movements. In comparison to my X-Trac the QcK+ is 3 times the area (277.89 square inches versus 90.86 square inches). That gives you an idea of the amount of desktop real estate covered by the QcK+. It’s not a pad aimed at someone with a lack of room although they do offer the QcK in smaller sizes for those of you that are starved for space. The surface is silky smooth and offers great feel and all three of my mice track beautifully across its surface. Accuracy of tracking is fantastic with both my laser mice, the MX610 and Laser 6000 and my old school wireless optical mouse, the MX700. This tells me that no matter what optical mouse you throw at this pad you’re going to get great performance. I don’t have a ball mouse on hand to check it with such as the old Razer mice but I’m willing to bet that the surface offers enough traction to spin a mouse ball just fine. I’ll amend this in a few months time to update the durability of the pad as it’s brand new and I am not going to tear it up just to see how well the surface is bonded to the backing. If you were expecting carnage I can only say sorry, not this go-round. 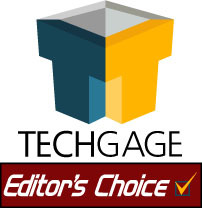 Overall I’m awarding the SteelPad QcK+ a 10/10 and our Editors Choice award. It’s a beautiful mousing surface and offers you the size needed for precision tasks without worrying about sliding your mouse off the edge. It’s also deadly comfortable for resting your hand on. The only minus would be the shear size of the pad which is also it’s selling point. Some people need a pad this big while others don’t. For those of you that don’t need a huge pad look into the junior sized versions because the quality is just as high with less quantity. Feel free to discuss this review in our forums . You do not need to register in order to discuss our content!